There are two other type of film holders that get confused with the Grafmatic. The first is the older Cut Film Magazine or “Bag Mag” which held 12 or 18 sheets of film. I’m not sure when they were introduced, mine has a patent date of 1920. There was also a version for glass plates which was basically the same except that it used thicker septums. The septums were loaded into the metal body of the magazine. 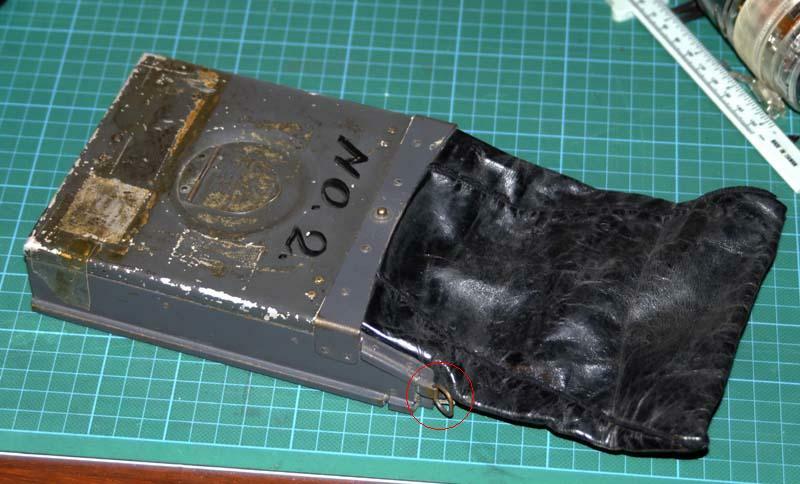 After making the exposure a lever in the side is slid towards the leather bag dragging the septum down into the bag. The septum can then be manually maneuvered back into the magazine at the back of the stack of septums. 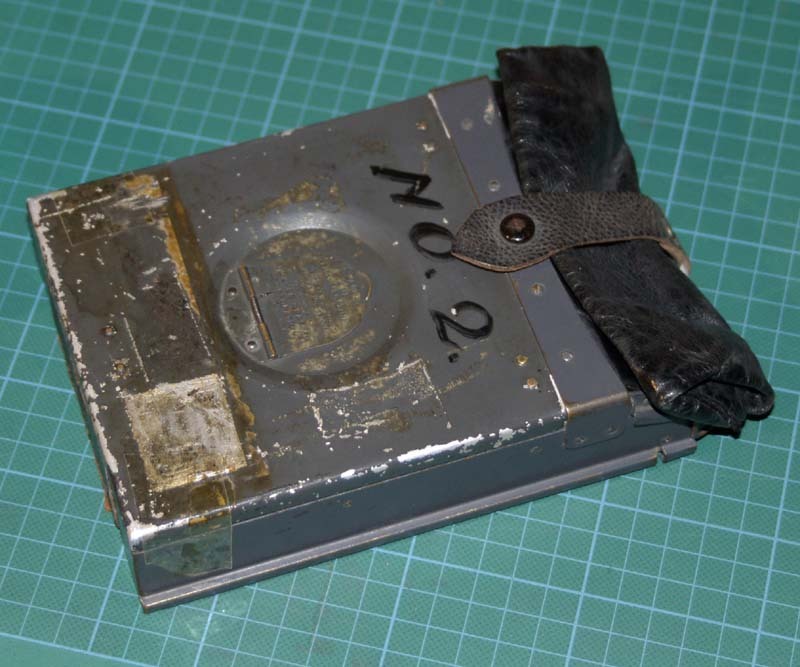 4×5 Cut Film Magazine with bag rolled up. 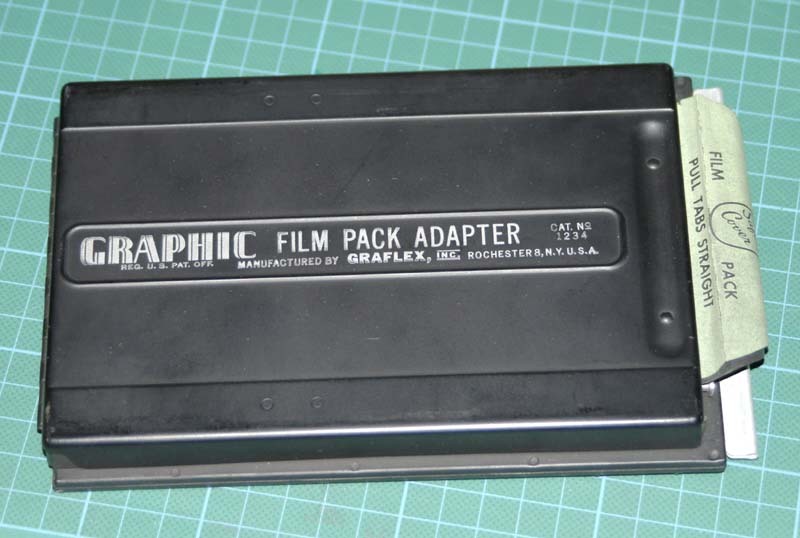 The Film Pack adapter is also often confused with Grafmatics. These take a preloaded pack of 12 sheets of film which have sheets of paper attached to their left side. The paper is draped around a curved bar and then sits at the back of the sheets of film with the ends of the paper hanging out of the right hand side of the pack. After making the exposure the photographer pulls the tab of the top sheet of paper. This pulls the sheet of film from the front of the pack around the curved bar to the back of the pack. The downside is that the film base had to be thinner than usual to allow it to be flexible enough to be pulled through a tight 180 degree turn without creasing. The film pack was discontinued by Kodak in the early 1990s so the adapters are pretty much useless nowadays.